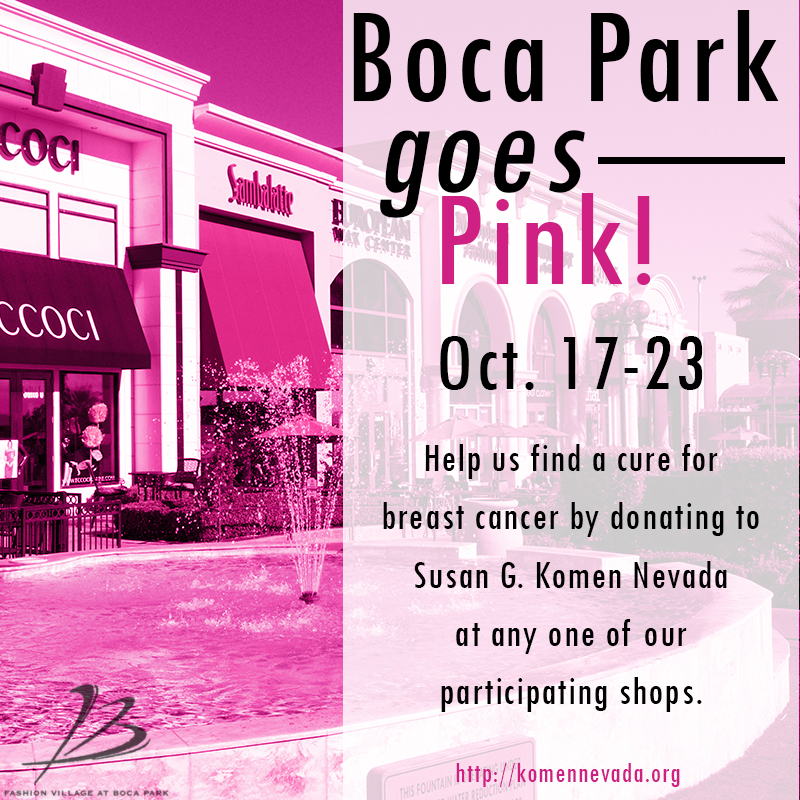 Boca Park is “Going Pink” in honor of Breast Cancer Awareness Month to support Susan G. Komen Nevada. Starting today, through October 23rd, patrons visiting Boca Park Fashion Village will be able to give back to this terrific cause by purchasing specialty pink wristbands, taking advantage of pink-themed specials or by simply giving a donation at participating retailers. The retail center will physically turn pink as well with breast cancer ribbons displayed throughout the center and pink lighting to celebrate survivorship and honor those who have lost their battle. To make a difference by supporting the fight against breast cancer, patrons can visit the following participating retailers at Boca Park Fashion Village to purchase a special Boca Park breast cancer wristband or to make a donation: Eccoci, European Wax Center, Gifted, Mastroianni Fashions, The Mixx Grill & Lounge, Modena Fashion Boutique, Hussong’s Cantina, Pinkberry, R+D Hipster Emporium, Sambalatte, Savvy Lingerie and XCYCLE. A premier shopping and entertainment destination, Boca Park is a unique and diverse open-air retail village with an array of shops, restaurants, fitness, beauty and specialty services that appeal to locals and visitors alike. Located in the heart of the southwest valley, just south of Summerlin Parkway at the corner of Rampart and Charleston boulevards, Boca Park Market is home to big box retailers such as Target, Ross, and OfficeMax. Boca Park Fashion Village boasts high-end boutiques and restaurants offering one-of-a-kind fashion, beauty, food, fitness and social hang-outs. 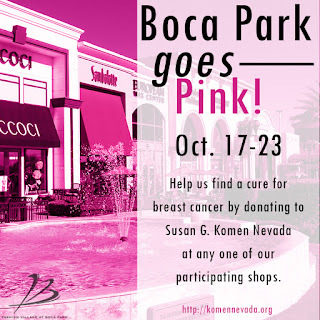 For more information, visit www.bocaparklv.com or follow Boca Park on Facebook, Instagram, Twitter and Pinterest. For leasing, contact Triple Five Group at (702) 430-5800. Susan G. Komen is the world’s largest breast cancer organization, funding more breast cancer research than any other nonprofit while providing real-time help to those facing the disease. Komen was founded in 1982 by Nancy G. Brinker, who promised her sister, Susan G. Komen, that she would end the disease that claimed Suzy’s life. Komen Nevada is working to better the lives of those facing breast cancer in the local community. Through events like the Komen Las Vegas and Komen Reno Race for the Cure®, Komen Nevada has invested more than $11 million in community breast health programs throughout the entire state and has helped contribute to the more than $920 million invested globally in research. For more information, call the Las Vegas office at 702.822.2324, the Reno office at 775.355.7311 or visit komennevada.org.